The water heater is an integral component of the plumbing system, heating and delivering hot water on demand. Your Oregon Certified Home Inspector will conduct a visual inspection of the home’s water heater and supporting systems during your Home Inspection. This article will specifically cover the inspection of a gas fueled water heater, and some of the more significant inspection points. ​​#1) Inspecting the Temperature / Pressure Relief (TPR) Valve: The Temperature / Pressure Relief Valve is designed to relieve pressure at a designated PSI (pounds per square inch) or temperature. Under normal operating conditions, water should not discharge from the TPR valve, as this is a safety component designed to alleviate pressure and heat within the system from causing serious damage or injury. If there is evidence of water discharging from the TPR valve, your Inspector will recommend further evaluation by a licensed, qualified plumbing contractor. Causes can vary, and will likely require a more invasive inspection to determine the issue. Thermal expansion, excess system pressure, low temperature relief, incorrect system settings and foreign material within the water heater are all possibilities. Your Inspector will also identify TPR discharge lines that terminate too far from the floor (more than 6”), or terminate to an unknown location. The purpose of the discharge line is to safely handle the pressure and water temperature, and should be routed towards a drain or the floor itself. Shutoff valves, plugs or caps should never be installed on these lines, as they defeat the purpose of the safety component. #2) Locate and Inspect the Cold Water Supply Valve: This shutoff controls the supply of water to the water heater, and is typically located along the cold water piping to the tank. In some cases, there is a separate valve near the water heater which serves as a shutoff between the water meter and the water heater system. For reasons of safety and in order to perform maintenance or repairs around the home, a “main” shutoff should be clearly labeled and accessible to the homeowner. Be sure your inspector identifies and examines the shutoff valve, and includes notes on the location and condition in the inspection report. #3) Locate and Inspect the Gas Fuel Shutoff / Sediment Trap: Every gas-fueled system in the home requires a shutoff within sight or in the same room as the equipment, the water heater is no different. The shutoff should be cleared labeled or marked (typically in red). The shutoff is a required component of the gas-fueled system, as well as a properly installed sediment trap or ‘drip leg’. The drip leg is installed in such a way that debris or moisture in the line can be caught in the trap and easily cleaned out. Gas systems which are missing this component should be noted by the inspector on their inspection report. #4) Visual Inspection of the Tank and Components: The draft hood for the system exhaust should be centered, and level. Proper venting material should be used to route the exhaust to the exterior of the home. Note any corrosion near the base of the tank, the pipe and tank connections, and the overall condition of the tank. Ensure there is plenty of ‘working’ space around the water heater system, and if located in a garage, the tank should be installed on a platform at least 18” high. Other recommendations are crash barrier posts, and seismic straps securing the tank in the case of an earthquake. 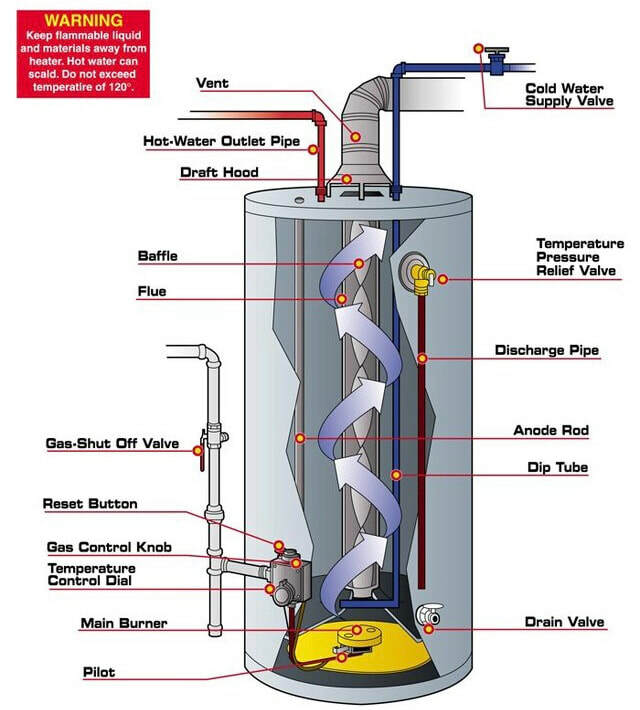 While there are other components included in the water heater inspection, these are several of the more prominent parts of the system. Knowing where the shutoffs are located, how the exhaust is directed to the exterior of the home and if safety devices are properly installed are key to providing a comprehensive inspection report.